Tart warmers are sold in many stores, especially Yankee Candle. Basically, instead of using a candle, you melt a small, wax object called a tart. Tarts are scented just like many candles. You can choose from a wide variety of electric tart warmers or standard tart warmers that are heated by a candle. I personally recommend using the electric tart warmer. They are fun and inexpensive. Electric tart warmers also make great gifts! Electric tart warmers are a great alternative to using candles. If you have small children in your home or pets that are proned to knocking into furniture, having a candle lit can be very dangerous. Even in situations with all grown adults, there are times when candles can still be a hazard. Accidents happen, so if you'd like to prevent a fire in your home, an electric tart warmer might the best option for you. 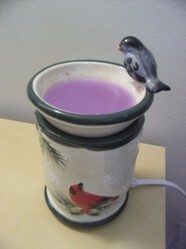 Of course, it is important to note that tart warmers do hold hot wax after its warmed up. You still don't want to leave any type of tart warmer in a spot were children might try to play with it. You don't want anyone burning a hand or arm! Have you ever noticed smoke coming from your candle when it starts to burn for too long? How about that nasty puff of smoke that billows out from the candle when you blow it out? If you think it looks ugly coming from the candle, imagine what it is doing to your lungs. 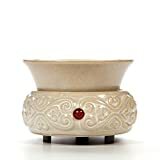 Instead of dealing with the smoke from a candle, you can simply plug in the electric tart warmer, add a tart, and then smell the wonderful fragrance in no time. In many cases, the tart scents are just as nice as any candle you could have bought anyway. If you are having a hard time converting to the tart warmer because you aren't sure about the scents, don't worry! Tarts come in a number of different scents. If you shop at Yankee Candle and prefer their candles, you are in luck. Just about any candle scent Yankee Candle sells is also available as a tart. Yes, sometimes you might not find tarts in other stores, but you'd be surprised just how many places do sell some type of tart or wax disk for warmers. Furthermore, the scent is just as strong as any candle. So Many Tarts, So Little Time! Box of 12 Yankee Candle Tarts(R) spring and summer scents. Tart Warmers Are Really Cute! Electric tart warmers come in all shapes and sizes. You can find them in many different colors. It doesn't matter what look you have in your home, you can usually find an electric tart warmer to match it. Also, some tart warmers have a theme. There are winter tart warmers with birds and snow, or even Santa Claus. You can also buy a summer tart warmer with seashells or a sunny theme. There are plenty of plain designs for use any time of year. You can opt to keep the electric tart warmer out year-round or just use certain tart warmers for certain seasons. Electric Tart Warmers Make The Most Sense! If you are still trying to decide between an electric tart warmer vs. a tart warmer that uses a candle, think about this: why would you light a candle in a warmer so it can heat up a tart? Now, you are still using a candle AND using a tart at the same time. That seems like double the cost to me. Not to mention, you now still have a candle burning, which defeats the purpose of the tart warmer, in my opinion. Electric tart warmers barely cost any money to use at all. I am big on saving money on the electric bill and I run my tart warmer regularly. I've never seen any difference in my electric bill. Since it barely uses any electricity, why pay extra money to buy tealight candles and tarts? Why not just use only tarts with an electric tart warmer? It is easier, less expensive, and safer. Electric tart warmers are definitely the way to go! I also like how pretty candles look when they are lit, but a tart warmer is so much safer. None of that black smoke to worry about once the candle is blown out! Thanks for your comment. I love these things. I had one and it broke a couple years ago. Haven't replaced it. I needs to go to the Yankee Candle store and get another one. I love those little tarts and the great smells you can find. Very cool! I never knew what those flat-looking candle-like things were but now I know! And I just might buy a tart warmer sometime. Thanks for the information. Beeswax candle making can be a fun craft for the whole family. And the resulting candles make great gifts too! Candle-making is a fun craft to do. Do you want to make candles? Get to know the candle-making supplies you need to start making candles.